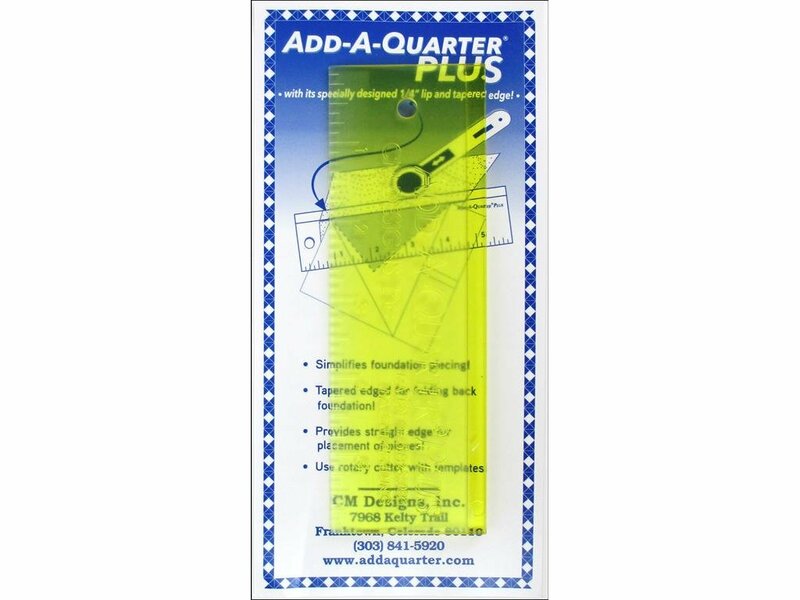 HOME > Notions > Ruler Add A Quarter Plus 6"
Ruler Add A Quarter Plus 6"
CM Designs Rulers combine the speed of rotary cutting quilt pieces with the accuracy of using templates. It will automatically add a seam allowance to any straight angle, and provide a straight edge for your rotary cutter. It's fast, easy, you can cut multiple layers, and it is made of recycled plastic! 6" Add-A-Quarter® Plus- With a specially designed 1/4" lip! Marked in 1/8" increments. Use your rotary cutter when foundation piecing to trim excess fabric, and provide a straight line for the next fabric placement, and the tapered edge can be used when folding back the foundation paper.